The shoulder joint is extremely mobile and consists of the head of the humerus and the glenoid cavity on the shoulder blade. These bones are connected by muscles, tendons and ligaments. Although this allows for a very large range of movement, it also harbours a high risk of injury, for example, in sports or after a fall. Special supports stabilise the shoulder and promote healing. The shoulder joint is one of the most mobile joints in the human body. The interaction between muscles, tendons, ligaments and bone allows for a wide variety of quick movements. Shoulder injuries or operations restrict patients enormously. Dislocation of the shoulder joint is one of the most common causes. In most cases, the whole arm then has to be immobilised to prevent harmful movements. The shoulder supports from medi stabilise the shoulder, correct any faulty positioning and can be put on by the patients themselves. Two buckles enable the patient to limit movements of the shoulder individually. The anatomical knit reduces swelling. 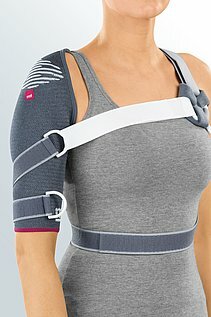 For example, medi shoulder supports can be used after dislocating a shoulder, after an operation, for fractures or for joint cartilage damaged by osteoarthritis.